brew city walk ( er crawl ... as it may be .) - Zombiewalk.com - Your source for all Zombie Walk and Zombie Flash Mob planning! we were sittin around drinkin , when my friend matt the ratt and i had this idea . 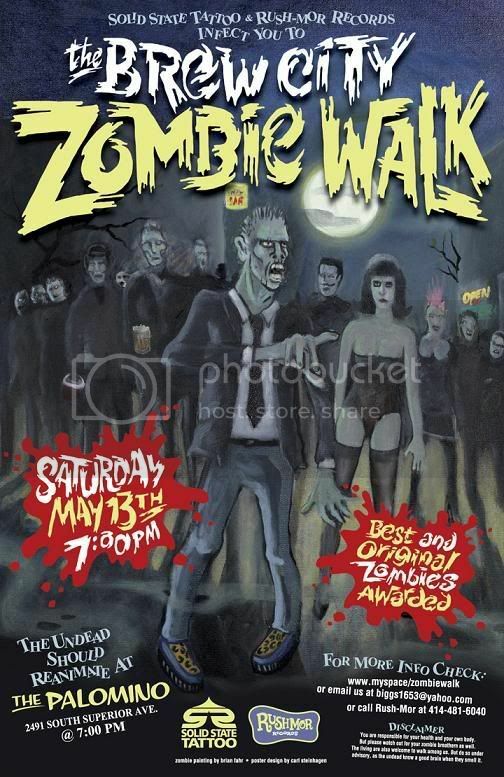 a pub crawl like no other , zombies walking dead through the streets of milwaukee . we've heard rumors about zombie walks , but weren't sure if they had been done or not . being in the state we were in , we thought , this sounds like a great idea , thus began the process . after picking a date and a couple of weeks , we finally found other zombie walks , some even found us . in doing so we found that most of the others were day time walks (semi-family) . well , we figured , we're no saints , and here in milwaukee we're always looking for another good reason to drink . so ... just add beer , and it begins . . . Brew City Zombie Walk , first stop The Palomino on russell , 7:00 pm . may 13 , 2006 .
if we are still living in chicago we will be there. I will also let a few of milwaukee friends know. Do you have anymore details?